A law firm has criticised Bell Pottinger's senior management for failing to exercise "extreme care" over a campaign in South Africa. 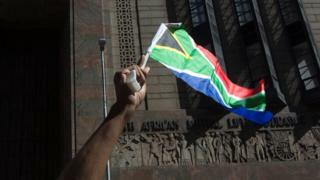 South Africa's opposition Democratic Alliance had accused Bell Pottinger of a "hateful and divisive campaign". In its review released on Monday, the law firm said: "[Bell Pottinger's] senior management should have known that the campaign was at risk of causing offence, including on grounds of race. "In such circumstances, BP ought to have exercised extreme care and should have closely scrutinised the creation of content for the campaign. This does not appear to have happened." Herbert Smith also found that certain material created by Bell Pottinger for the economic emancipation campaign "was negative or targeted towards wealthy white South African individuals or corporates and/or was potentially racially divisive and/or potentially offensive and was created in breach of relevant ethical principles". James Henderson, chief executive of the PR firm, confirmed his resignation on Monday, saying he "neither initiated nor was involved in the Oakbay work". However, he added: "I accept that as CEO, I have ultimate executive responsibility for Bell Pottinger. I feel deeply let down by the colleagues who misled me. However, I think it is important I take proper accountability for what has happened." The PR firm's chairman, Mark Smith, said Mr Henderson's decision to resign was "laudable". Phumzile Van Damme, the Democratic Alliance's shadow communications minister, said his resignation was "not in any way an act of valour". The Guptas have been accused of using their connections with South Africa's President, Jacob Zuma, to win contracts and influence political appointments. Mr Zuma and the Guptas strongly deny all allegations. Over the past quarter of a century, Ajay, Atul and Rajesh Gupta, who hail from India, have built a huge conglomerate with interests in South Africa ranging from mining to media - and stand accused of corruption on a vast scale. They deny all allegations. Bell Pottinger was accused of spreading talk of "white monopoly capital" in a country where there are sensitivities about economic disparities between the black majority and white minority. Herbert Smith Freehills, which examined more than 45,000 documents, reported that Bell Pottinger's management should have known their campaign "was at risk of causing offence, including on grounds of race". The law firm added that management had several opportunities to discover the spread of false information, but these were missed; and that Bell Pottinger's managers "failed to put in place policies and procedures to minimise the risks associated with this account".